The Robert Bogdan Disability History Collection at the Medical Historical Library (in the Harvey Cushing/John Hay Whitney Medical Library at Yale University) contains over 3,500 photographs and ephemera representing disability. Since the 1980s, Bogdan had collected such representations, ranging from the 1870s-when photographic images became popularized—to the 1970s at the heights of the disability rights movement. Bogdan’s 2012 collaborative book with Martin Elks and James A. Knoll, Picturing Disability: Beggar, Freak, Citizen, and Other Photographic Rhetoric (Syracuse University Press), provides a broader historical context of the collection, including a history of different types of citizen portraits. The carte de visite was the most common photographic format from 1860 to 1885, with each photograph printed from a negative and mounted on a piece of thin cardboard; some people chose to have the photograph on a postcard, so as to send messages to family and friends. Cabinet cards were also popular at the end of the nineteenth century, though they were three times larger than the carte de visite. Citizen portraits were often taken at a local studio, positioning subjects to “echo family visual rhetoric, not disability conventions”—there is no obvious attempt to conceal the disability, for it is part of the family reality as conveyed in the photograph. Other photographs also use props and positioning of people to convey “normal life” within an inconsequential setting to frame an image’s ordinariness, instead of using disability to define the situation. Disability technologies and other visual indicators of disability are prominently present in many of these photographs. 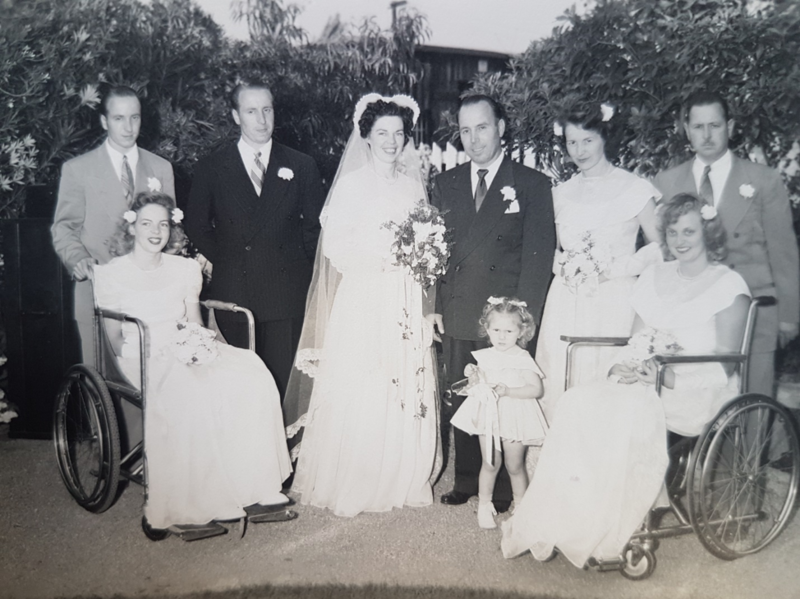 As Bogdan points out, “their presence is not so intrusive as to change this picture’s place in the category of atypical family photograph.” In this wedding portrait, for instance, the two women in wheelchairs are part of the wedding party and positioned to provide balance—the same way a photographer will arrange individuals according to height to obtain symmetry in portraits—without drawing much attention to their wheelchairs. Wedding party with 2 women in wheelchairs, from the Robert Bogdan Disability Collection MS Col 61, Book 1: Wheelchairs. These photos also do not tend to specifically feature the disability object, rather positioning the people within normal portraiture conventions, whether it is to show romance or familial ties. 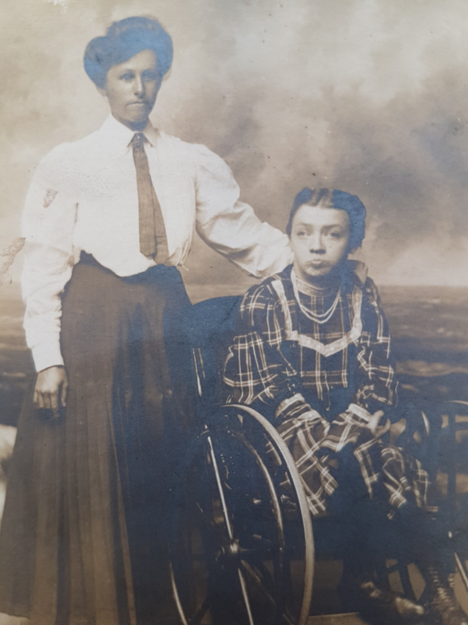 The use of additional props, moreover, were used to further confine the photographs within portraiture traditions – the disability technology, though consciously included in the photos, are not the subject of the portrait. Rather, it is the people and their relationships with each other. As Bogdan asserts, “Although some of the images were shared, even sent through the mail, they were distributed privately to intimates, family members, and friends. They were not produced for commercial public relations, to solicit money, to sell, or for personal or organizational gain.” Through these images, we can see most assuredly that people with disabilities were “too busy living to be restrained by our post-structuralist worries over the cultural contingencies of what they did or who they were,” as Ott has remarked. 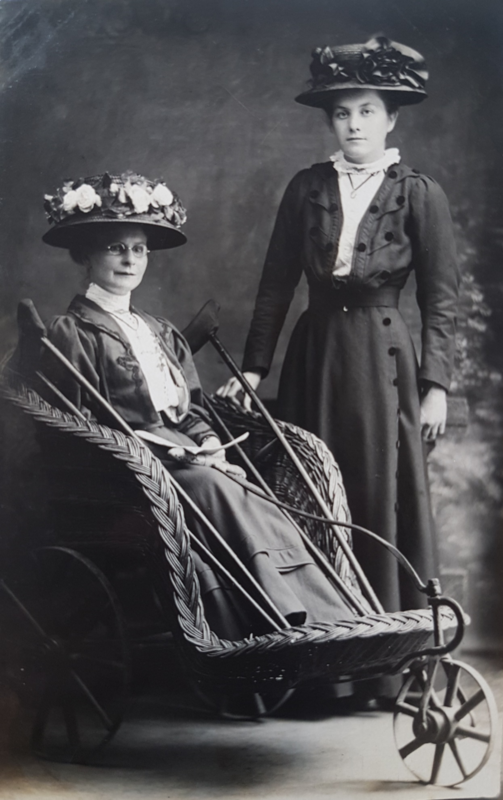 Assorted photographs of women in wheelchairs accompanied by other people, from the Robert Bogdan Disability Collection MS Col 61, Book 1: Wheelchairs. One series of photographs piqued my interest: of individuals outdoors in wheelchairs that have chains attached to the wheels. This design feature appears in different styles of wheelchairs, but I have never previously encountered it in my research, either in manuscripts and archives, or in material culture collections. Inspecting the photographs, I took an educated guess: would these be for raising or hoisting the individual from the chair? My guess didn’t seem right to me, so I took my question to twitter. As historians have discussed, crowdsourcing on social media is useful for harnessing participatory knowledge. It blurs the boundaries between specialist and non-specialist knowledge, offering new insights for working with primary sources. What seemed to me to be a questionable, confusing design feature was quite obvious to others – the wheelchair is a hand-crank, with the chains fixed to move the wheels the same way that a bicycle pedal moves a bicycle. Now, since I don’t own or ride a bicycle, chain gears were not something I was familiar with, but others have shared their knowledge to enable me to paint a better picture of how this design feature was useful for wheelchair users. 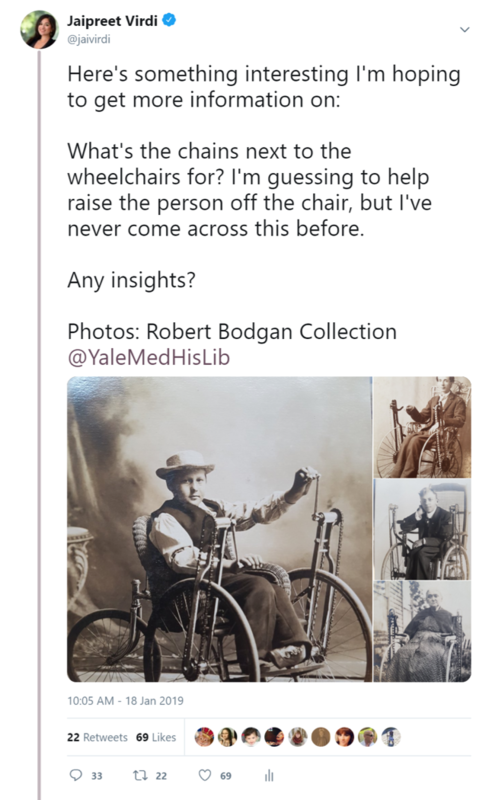 The exchange on twitter formed a conversation about self-propelled wheelchairs that governed my research through the Bogdan collection and the broader history of the wheelchair. Litters, swings, cradles, carts, carrying-chairs or sedan chairs were used prior to the formation of the wheelchair as we know it, and individual chairs were not mass-produced until the mid-twentieth century to assist the increasing numbers of soldiers surviving from spinal cord injuries. 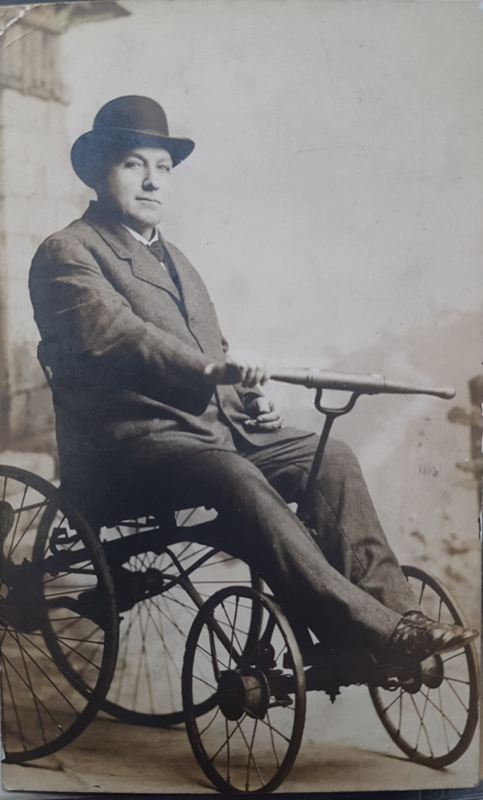 Wheelchairs became associated with disability and thus, users were stigmatized and perceived as unable to contribute to society. These photographs, however, reveal the extent to which disabled people governed their own lives and sought to be self-sufficient, even taking an action pose in their studio portraits to represent their maneuverability. Man in wheelchair formed like a cart, from the Robert Bogdan Disability Collection MS Col 61, Book 1: Wheelchairs. As Penny Wolfson has shown, users relied on their own craftsmanship or that of others to shape a mobility device for their own needs. Wheelchairs could be made by adding cart wheels on dining or library chairs, by repurposing motorcycle engines, or adding gears for hand-cranked wheelchairs. While most nineteenth-century wheelchairs were manufactured by furniture makers prizing comfort, adaptability, and mobility, some users repurposed from household furniture and included crafted additions for comfort: home-sewn cushions, crocheted blankets or feet mats, and trinkets attached to spokes. These features provide us with clues into the personalized relationship between user and technology, presenting experiences of disability that were not always negative or exclusive. Moreover, photographs of disabled wheelchair users in various settings—in a field, in the streets, on the porch—indicates the challenges of maneuvering within the built environment, especially of navigating on unpaved streets. The wheels, cranks, and other design features that are visible in the photographs additionally reveal variants of disability experience. By the 1970s, wheelchairs became markers of disability as well as symbols of activism, leaving behind intimate traces of their owner(s). And those hand cranks aren’t simply designs of the past; old designs can always be made new again. *Jaipreet Virdi is a historian of medicine, technology, and disability. She is an Assistant Professor in the Department of History at the University of Delaware. Her first book, Hearing Happiness: Fakes, Frauds, and Fads in Deafness Cures will be published by The University of Chicago Press. The Ferenc Gyorgyey Research Travel Grant generously supported this research; special thanks to the grant selection committee and to Melissa Grafe. 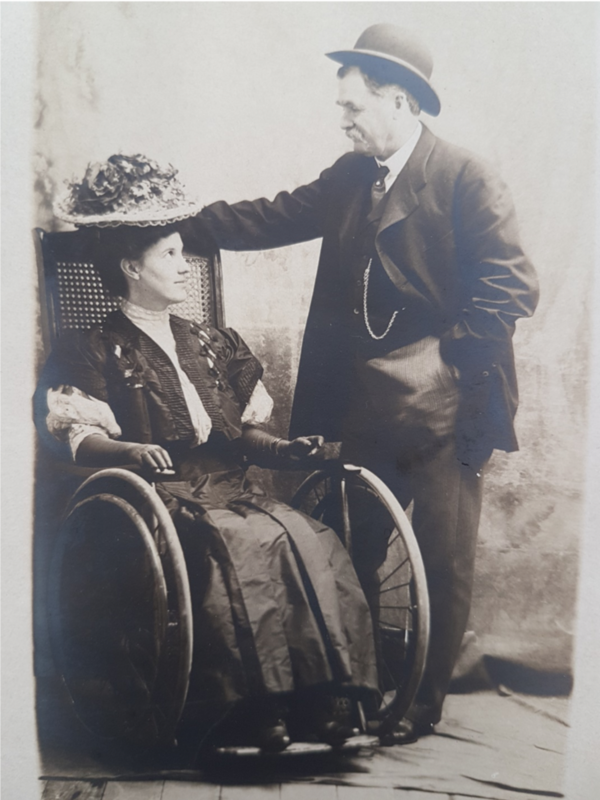 Photograph images from the Robert Bogdan Disability Collection MS Col 61, Book 1: Wheelchairs. You can find Jai on twitter as @jaivirdi. Katherine Ott, “Disability Things: Material Culture and American Disability History, 1700-2010,” in Susah Burch and Michael Rembis (Eds. ), Disability Histories (Chicago: University of Illinois Press, 2014), 119. Toby Siebers, “Disability in Theory: From Social Constructionism to the New Realism of the Body,” in Lennard Davis (ed), The Disability Studies Reader (New York & London: Routledge, 2006), 177. Catherine Kudlick, “Disability History: Why We Need Another ‘Other,” The American Historical Review 108.3 (June 2003): 768-793. Rosemarie Garland-Thomson, Extraordinary Bodies: Figuring Physical Disability in American Culture and Literature (New York: Columbia University Press, 1997). Robert Bogdan, Martin Elks and James A. Knoll, Picturing Disability: Beggar, Freak, Citizen, and Other Photographic Rhetoric (Syracuse University Press, 2012), 145. Bogdan, Elks, and Knoll, Picturing Disability, 146. Bogdan, Elks, and Knoll, Picturing Disability, 154. Bogdan, Elks, and Knoll, Picturing Disability, 145. Katherine Ott, “The Sum of its Parts: An Introduction to Modern Histories of Prosthetics,” in Katherine Ott, David Serlin, and Stephen Mihm (eds. ), Artificial Parts, Practical Lives: Modern Histories of Prosthetics (New York: New York University Press, 2002), 1-42; 3. Penny Lynne Wolfson, “Enwheeled: Two Centuries of Wheelchair Design, from Furniture to Film,” MA Thesis, Cooper-Hewit, National Design Museum, Smithsonian Institution and Parsons the New School for Design (2014).